FUSE is a dynamic coworking space for the community to connect, create new ideas through collaboration and foster continued growth and sustainability in our entrepreneurial ecosystem. From humble beginnings, our story can best be simplified as: three guys, a credit card and a dream. After moving to Lincoln to work remotely, Bob Hinrichs felt like he was missing something from his work life. Hinrichs shared this feeling of isolation with a colleague, Matt Westenburg, who had a passion for the success of the startup and entrepreneurial community. Hinrichs and Westenburg believed that Lincoln had the ability to attract young professionals who wanted to do something exciting; enter into the startup world. At a friend’s barbecue, Bob met entrepreneur and independent consultant, Andy Beecham, and through casual conversation a light bulb: an idea for a vibrant space in the Haymarket where a variety of workers with different backgrounds could share a common space to work together, better. They wanted to focus on the three core values of the coworking movement: community, collaboration, and sustainability. 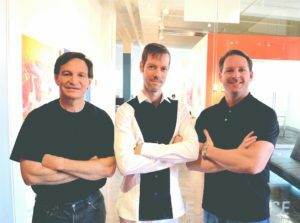 A year after the initial spark of passion between the three founders, the doors opened at their first coworking space in Lincoln, Nebraska. The original location was above The Mill Coffee & Tea in the Haymarket. This 2,500 square foot area included, at most, 12 members. As the Lincoln community grew, so did the need to have a dynamic shared space. Nelnet and Speedway also became passionate about the coworking idea and helped make the dream a reality. Roughly three years later, in 2016, the present day location of FUSE opened just across the street, in the rustic Salvation Army building. With almost 150 active members and over 40,000 square feet, FUSE offers a versatile space where historical elements meet modern design. As coworking becomes more popular worldwide, FUSE hopes to progress Lincoln’s top technology and talent groups by focusing on the main goal of igniting inspiration and supporting organic collaboration. FUSE facilitates ideas and inspires growth. FUSE is a beacon for innovators, creators, educators. FUSE brings together diverse experience and knowledge. FUSE accelerates the innovative spirit of the Silicon Prairie. FUSE is the innovative space for our community thought-leaders, innovators, entrepreneurs, intrapreneurs, remote workers, startups, corporate project teams, and educational and community partners to collaborate, create, learn, lead, and foster our flourishing local and regional entrepreneurial and startup ecosystem.